This is crossposted from The Last Word on Nothing, a science writing blog where I just became a regular contributor! When I put on the metallic silver unitard and homemade alien mask that rainy morning, I had no idea that I was about to embark on one of the most stressful weekends of my life. A mask gives you freedom to reinterpret yourself. Sort of like the way being drunk cleanses you of all your inhibitions: Maybe you dance “15,000 times better in costume than out,” as one of my friends puts it, or maybe you finally have an excuse to talk to that cute stranger dressed as a box of wine. To wear a costume is to take on a sort of power. But the difference with my alien getup was that it wasn’t Halloween. It was an ordinary March day. 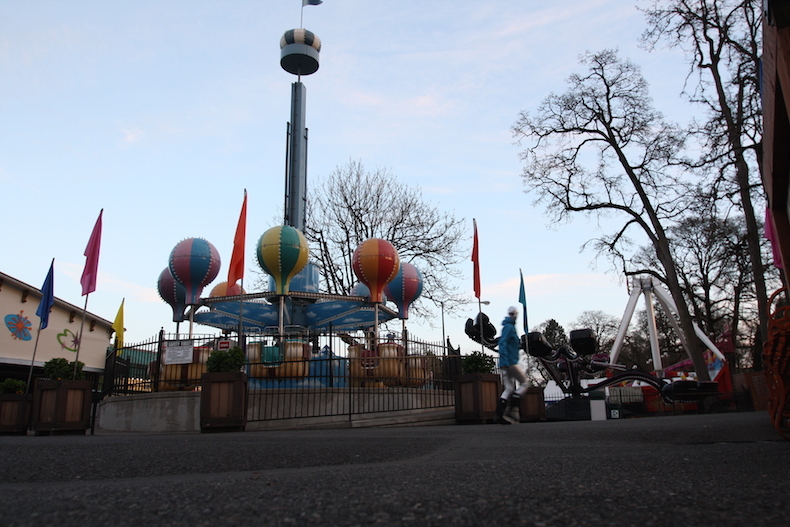 As a newcomer to Portland, Oregon, I had decided to take on the role of the ultimate foreign visitor for a travel story that I was writing – a sort of cross between performance art and social experiment where I would spend 48 hours seeing the city’s sights through black, ovoid eyes. There was a tenuous journalistic angle, in that Oregon had the highest per capita rate of UFO sightings in 2014, and Portland was a hotspot. But it was personal, too: Moving from a town of 1,500 to a city of 600,000, I felt invisible. I yearned, with tinges of existential dread, to set myself apart from the faceless masses. To be a special snowflake. A special alien snowflake. Pretty much as soon as I set out on my bike, though, it became clear that being a special alien snowflake is really uncomfortable. I tapped a guy on the shoulder at an overlook on the Willamette River and he paled. “Wh-why are you wearing that?” he stammered. 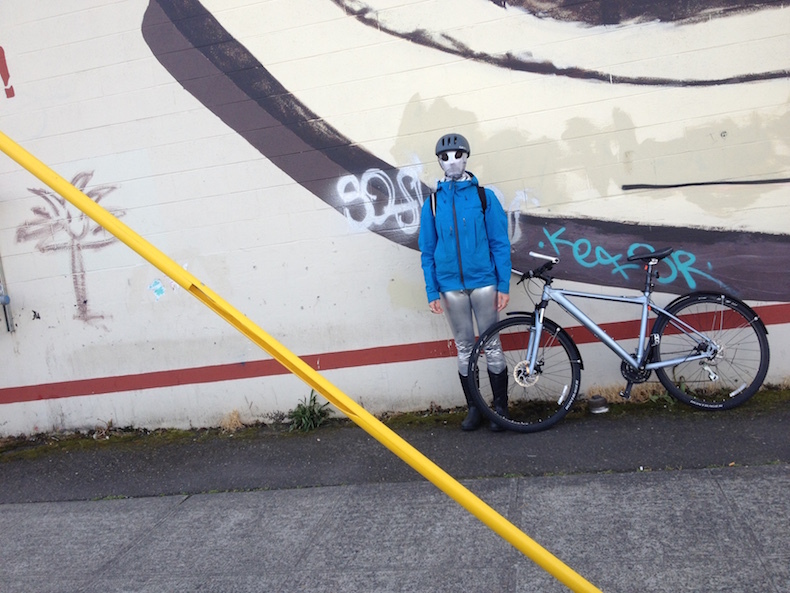 I posed in front of one of Portland’s famous bridges in what I thought was the most extraterrestrial way possible, stiff and straight and expressionless; not a difficult thing since my mask lacked a mouth or any other discernable facial feature other than giant mesh eyes. My new friend, though, had assumed a sort of twisted grimace; as soon as my iPhone was back in my hands, he turned on his heel and practically sprinted away down the bike path. Others appeared similarly startled as I pedaled past them, quickly averting their eyes or refusing to look at me at all. Later in the weekend, a teenage boy followed me down the sidewalk for at least two city blocks, yelling horrible obscenities about my tight pants. When yelling obscenities back failed to deter him, I ducked down a sidestreet and hid in a rare books shop. The outfit prompted unusual kindness as well: in line at the Oregon Museum of Nature and Science (to see the display of real human fetuses, natch), children smiled at me shyly and adults welcomed me to planet Earth and asked what I thought of it so far. And when I surrounded myself with other misfits – the punky crew of folks who “Zoobomb” down one of Portland’s steepest hills on children’s bikes, or the Pabst-drinking hipsters at a house concert – people embraced me and readily joined in my game. One guy was so taken with my alien costume that we struck up a friendship that continues to this day. I told him about my charade, about how exhausted I was after only a few hours. He didn’t seem surprised: “Well, you’re really putting people on the spot,” he said simply as he returned to wiping the counter. Indeed I was, and it was telling me a lot. A costume’s meaning depends entirely on context. What makes sense on Halloween assumes murkier connotations inside a bank, or in the multi-story Powell’s City of Books. I had sabotaged the delicate truce that allows us to glide past each other every day: Were I clad in normal clothes, strangers would hardly give me a second thought. But now they had to actively decide whether my crazy getup was an invitation or a threat, whether it made me a friend or a target, whether it was none of their business at all. And the tension of not knowing where they would arrive was tying my shoulder muscles in knots. But it was the bartender’s phrase “every day mask” that stuck with me: We all wear costumes, all the time. Suits, jeans, hairstyles, jewelry at our throats or in our faces. We use them to signify our identity or status. They help us recognize kindred spirits. And yet these kinds of costumes can also present the most insurmountable barriers to deeper human connection. They are a sort of armor around our vulnerabilities and insecurities. And unlike a wild disguise, they offer little opportunity to step outside of the rigid structure of casual social interaction to express something that doesn’t fit the expected narrative, no matter how much we might need to do so. Later that night, I stood outside of a skating rink at a historic amusement park in the south part of town, scrolling through text messages and steeling myself for the next wave of social oddness while I waited for the roller derby class I had signed up for to start. “Are you a mascot?” a woman with curly hair and glasses called to me from a gazebo-like structure as she stubbed out a cigarette. No, I replied, and gave her my line about being from REALLY far out of town. “Well, I’m a mascot. I wear a squirrel suit here at the park,” she said. When I asked what that was like, she explained how the costume made people laugh, or forget their troubles for a little while. One time, she said, a woman had even come to her, weeping and “drunk out of her mind,” to confess suicidal thoughts. The squirrel suit, perhaps, had offered a judgment-free countenance, a furry safe harbor. We said our goodbyes and I watched the squirrel lady disappear into the parking lot. 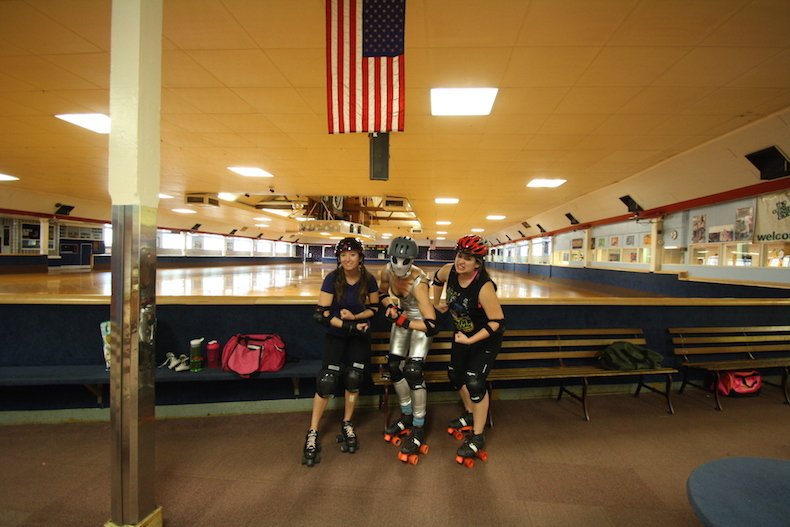 Then I took a deep breath, walked into the building, and strapped on a pair of skates. ← Is this climate change-battered conifer migrating northward?